1. There are many scared people inside our church and community. People who are afraid that their secrets will not make them acceptable. If you think that you’re not acceptable, then you’re wrong because everyone matters. You are loved. Whatever you’ve been through, you are not alone. 2. There is a power when a person speaks. Because when someone has the courage to speak out about something they previously thought was shameful, shame itself can’t survive being spoken. Shame does not survive when people respond with empathy and genuine friendship. 3. When you let yourself be seen, and start showing up, things can change for the better. It’s taking that first step – daring to do – which gets things going. Since 2011, many more women have dared to come up onto the platform here at Newbold Church to share their stories and it simply took that initial willingness to be seen and eventually connect with somebody which spurred them on. 4. Taking time to listen to other people’s stories will make a profound difference in your life. It made me realise that I am proud to be part of a church that does not try to cover up what happens … what happens in real life. Church for me is no longer a place to pretend and put up fake appearances. Painful things continue to happen in the community around us. Sexual abuse, emotional abuse, verbal abuse, neglect, betrayal, divorce, fights, to give you some examples. And these should not be hidden under the carpet. They should be confronted and people should be accountable for their actions and be directed to help. The pastoral team, including the elders and leaders, here at Newbold are there to discreetly direct you to professional help if you need it. Ultimately, you and I should look out for and protect those who are vulnerable and broken-hearted. 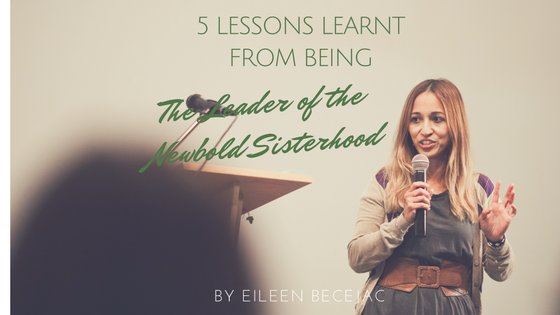 The Newbold Sisterhood is about leaning in, connecting and getting each other to flourish and making a positive difference in our community and everywhere.